The surgeons at Primary Eye Care have helped thousands of people enjoy better vision. Leading the way with new medications and surgical procedures, Primary Eye Care can diagnose and treat a wide range of diseases and conditions. We’re committed to providing our patients the most advanced care available. To find out more about any of these conditions and their treatments, just click on the underlined words. If your vision has gradually changed with age, and things don’t seem quite as sharp or in focus as they used to, you may be suffering from cataracts, a clouding of the normally-transparent lens of the eye. 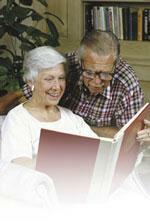 Cataracts can be treated with a quick, outpatient procedure. Open-angle glaucoma often has no symptoms until after vision loss has occurred. It is a leading cause of blindness, but if caught early it can be controlled. If you are African-American, have a relative with glaucoma, are diabetic or very nearsighted, you should have your eye pressure checked every year. Treatment of many eye conditions is covered by insurance, including Medicare. If you have questions about what is covered by your private healthcare insurance, contact your plan provider, or provide us with a copy of your insurance card and we’ll check for you. We accept most major medical insurance plans. If you have questions about your Medicare coverage, call 1-800-MEDICARE (1-800-633-4227) to speak to a Medicare Customer Representative. You can also go to www.medicare.gov to find out more about Medicare coverage. Our staff is also available to help you determine whether the eye care you need is covered by Medicare. Your out-of-pocket expenses for Medicare or private insurance will depend of the type of insurance you have, whether you have supplemental insurance and whether you have a deductible on your policy. We’ll be glad to process all insurance claims for you. We accept MC, Visa, AMEX, Discover, personal checks, cash and provide financing in our optical department and for surgical procedures. Senior Eye Health Bloomfield, Windsor, Avon, Ct.